Harrison Street will be closed at Patterson Avenue not allowing southbound traffic from Patterson Avenue to Observer. Harrison Street will be closed at Observer not allowing southbound traffic from Observer to Newark Street. Newark Street from Monroe to Harrison Street will be closed to both east and west bound traffic. Please plan ahead and give yourself extra time when traveling. The work being done on these roads is to prepare for the Hoboken meter facility upgrades, which will take place in the same location beginning on June 29. 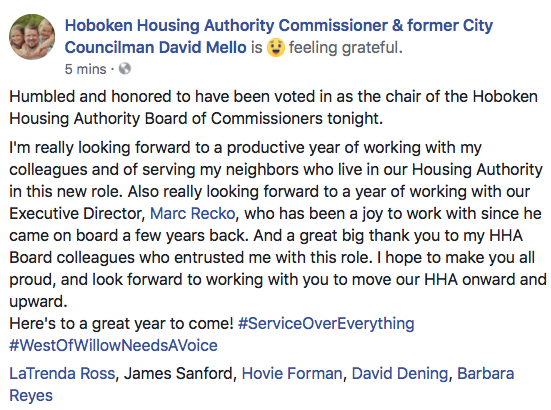 Former Hoboken councilman Dave Mello was elected Chair of the Hoboken Housing Authority board last night.